We are vitally interested in sustainability at TecEco. Our managing director, John Harrison, first invented Eco-Cements which set by absorbing CO2 out of the air. He then went on to design the Tec-Kiln so that the magnesia required could be made without releases. With Prof Cuff and others John's company TecEco have now formed the Global Sustainability Alliance and their Gaia Engineering project can potentially make buildings using waste and CO2 and produce fresh water as a bi product. Solving a number of the worlds problems was all a matter of imagination! We must stop thinking of CO2 as a waste, rather, we should use our imagination and start thinking of the gas as a resource. The problem is what can we do with it? Nature teaches us that CO2 in the form of carbonate can be used to build with and there are further advantages of doing so . There is plenty of magnesium in seawater - enough to last over a billion years without replenishment at current needs for sequestration. The low temperatures at which magnesite can be calcined mean that making magnesia is potentially very efficient and achievable at low temperatures with non fossil fuel energy using the TecEco Tec-Kiln. Magnesium has a low molecular weight so a lot of CO2 is bound to it. Magnesium goes further as a carbonate binder than calcium because bound water makes up a substantial part of the hydrated carbonate molecules like nesquehonite. Magnesium compounds are characterised by being capable of strong polar bonding to other materials making them excellent for bonding wastes of all kinds. Eco-Cements are made by blending reactive magnesium oxide with conventional hydraulic cements like Portland cement. They are environmentally friendly because in permeable concretes the magnesium oxide will first hydrate using mix water and then carbonate forming significant amounts of strength giving minerals in a low alkali matrix. TecEco cement including Eco-Cement are also very un reactive. The result is that many different wastes can be used as aggregates and fillers without problems. The reactive magnesium oxide used in Eco-Cements is currently made from magnesite (a carbonate compound of magnesium) found in abundance. In the Gaia Engineering tececology the magnesia required will be produced from seawater. 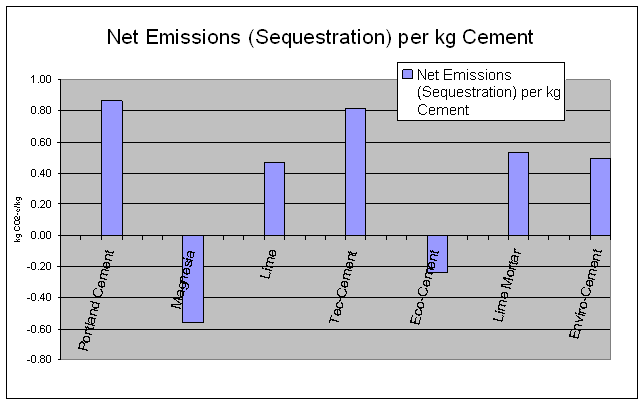 The emissions of Eco-Cement are compared to other cements in the bar chart below prepared assuming capture during the manufacture of reactive magnesia in the manner shown in the above diagram. 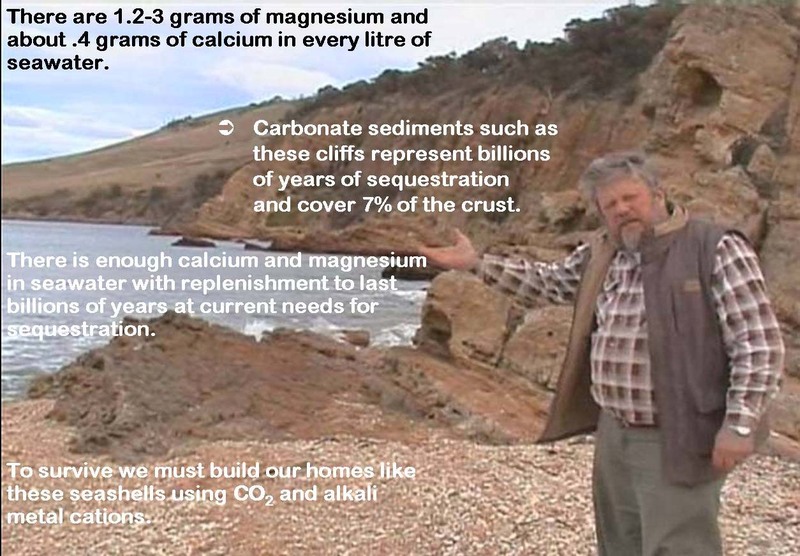 The more magnesium oxide in an Eco-Cement and the more permeable it is, the more CO2 that is absorbed. 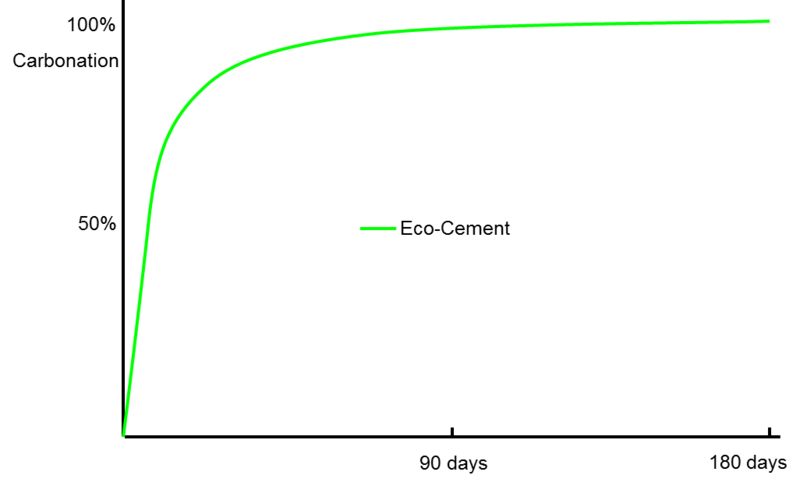 The rate of absorption of CO2 varies with the degree of permeability. Carbonation occurs quickly at first and more slowly towards completion as in the above graph Eventually total carbonation occurs in permeable materials. A typical Eco-Cement concrete block as in the graphic would be expected to fully carbonate within a year. Eco-Cement also has the ability to be almost fully recycled back into cement, should the concrete structure become obsolete. Eco-Cement can include more waste than other hydraulic cements like Portland cement because it is much less alkaline, reducing the incidence of delayed reactions that would reduce the strength of the concrete. Portland cement concretes on the other hand can’t include large amounts of waste as many of them will react with the alkaline lime that forms causes delayed and disruptive reactions. If you are a government or altruistic billionaire then please get in touch with us! We need your resources as without them we are powerless!